The year was 1854 and the Rev. J. Eschmann, a “pioneer preacher” from New York, came to Racine to do missionary work among the German-speaking people. On December 5, 1854, seventeen German Baptist friends of Rev. Eschmann who came from New York to Racine were the charter members of a new church called the “First German Baptist Church.” The Rev. J. Eschmann became the first pastor of The First German Baptist Church. The population of Racine at this time was about 5,000. At first they met in homes, the English Baptist Church and the old Courthouse. After two years, the church family had grown and at a cost of $600, a small chapel (“meeting house”) was built on Villa St. In 1867, the Rev. J. Wilkins of Germany was called to lead the church and a number of Baptists from Germany immigrated with him to Racine. “The work was strengthened considerably.” He was pastor until 1876. Following the Civil War, numerous German immigrants came to the United States and the church family grew. A new church building was needed. Since the majority of Racine’s population was along the lake, a new two-story church building and parsonage were built on Huron St. in 1876 at a cost of about $4,000. God sent a wonderful revival to The First German Baptist Church in the late 1880’s and the church family again experienced considerable growth. The church experienced some type of serious crisis in 1895, though historical documents don’t specify what it was. God continued to bless the First German Baptist Church and it outgrew its facility. In the early 1900’s, property was purchased on the corner of Milwaukee Ave. and Hamilton St. (1140 Milwaukee Ave.) in the amount of $3,200 and plans were made to build a new church. “The church had long been ready for a revival. Their prayers were answered and 47 were added to the membership.” A new church was erected on the property and the old church and parsonage was sold to the J. I. Case Threshing Machine Company for $5,000. 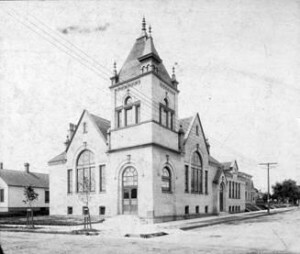 In 1904, The First German Baptist Church of Racine celebrated its Golden Anniversary (50 years) and the new church was dedicated. The church’s mission statement was: “OUR MOTTO: Christ first and always! OUR AIM: To lead every person to accept Jesus Christ as Savior and Lord! OUR TEXT BOOK: The Bible which is God’s revelation to man.” The church’s tag line: “The Friendly Church. In 1911 the Rev. E. Umbach became pastor and he organized a German mission station in Kenosha which later evolved into a church, and a chapel was built. He also started an Italian mission in Racine. The First Italian Baptist Church of Wisconsin was founded through his leadership. The First World War took its toll on the family of The First German Baptist Church as mental persecution was inflicted on Germans and the German language. Spies infiltrated the church every Sunday to determine whether the Rev. Umbach was preaching for Germany and against the United States. Although no action was taken against the Rev. Umbach, the spies often questioned him as to his loyalty since he was a graduate of the University of Breslau in Germany. It was suggested that it may be in the best interest of the church to change its name from German Baptist to a new name since the second generation of the church was not as familiar with the German language as their parents. The Articles of Organization were amended in 1922 to change the name of the church to “Grace Baptist Church” (although the meeting and vote on the name change took place on March 17, 1919). Initially the services were in both German and English. The Sunday School and evening service were conducted in English. In 1924 the use of the German language was discontinued entirely and all services were in English. There was a significant increase in attendance, especially on Sunday mornings. Several years later, the depression years began and both the church and its members suffered financial difficulties. Many building renovations happened to the church since 1924. The basement was excavated for new Sunday School rooms, a nursery was added, two new stairways to the basement parlor were constructed, and loud speakers were added as a memorial to Dr. and Mrs. Frederick Meyer, missionaries to the Philippines. The old parsonage was sold and a new one was purchased at 2417 Hansen Ave. The Rev. D. Raymond Parry became pastor in 1951 and through his leadership 101 new members were added. “The church school has experienced steady growth, building improvements continue and missionary giving has increased. Three of Grace’s young people committed their lives to full-time Christian service,” said Pastor Parry. Grace Baptist Church celebrated its Centennial Anniversary (100 years) in 1954. Grace Church continued to prosper and on December 17, 1967,the church family broke ground for a new church building at 5731 Northwestern Ave. The new facility was 16,300 square feet, could seat 470 people. The new facility included a chapel, office, church parlor, educational facilities, a kitchen, and a multi-purpose room large enough to seat 300 people for dinners. Grace’s membership at that time was 260. The new facility was dedicated by the Grace family on Sunday, December 8, 1968. A 55 foot high spire adorned the two story building. “We’d like to think our modernistic spire points men toward God, that it helps illustrate that the Gospel is relevant in the world we live in,” said the Rev. George Breitkreuz, Grace’s pastor. Grace’s old church building at 1140 Milwaukee Ave was sold to the city of Racine for use as a neighborhood center and headquarters for Project Breakthrough. The Dr. Martin Luther King Community Center is now located on this property. The name of the street was changed from Milwaukee Ave. to Dr. Martin Luther King Drive. Pastor Jerry Worsham was hired in September 1976. 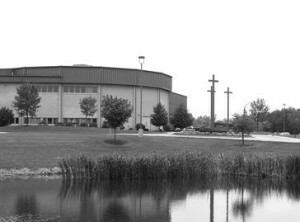 In 1977 Grace Baptist Church became a “parent church” to a church planting outreach called Community Church of Sun Prairie in Sun Prairie, Wisconsin, calling and ordaining Dave Rushton as Pastor. 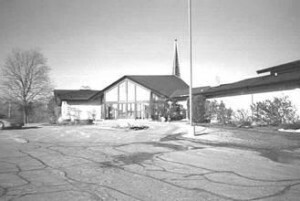 Community Church of Sun Prairie broke ground for their first church building in 1986. Grace Baptist Church continued to grow and soon it outgrew its facility on Northwestern Ave. After seeking God’s guidance, and through countless hours of planning by a dedicated group of individuals on the Properties Ministry Team, Grace Baptist Church purchased 62 acres of land on September 11, 1995. Ground breaking for the new church building took place in 1997. The name of the church was changed to Grace Church at a meeting of its members on January 26, 1998. God had blessed Grace Church with an awesome new state-of-the-art facility and the Grace family moved into its new home on March 14, 1999. The new facility is 75,000 square feet with a sanctuary that can accommodate a total of 1,830 worshippers (1,054 on the lower level and 776 in the balcony). In 2011, Pastor Jerry Worsham retired after 35 years of faithful service at Grace Church. Pastor Jerry helped to shepherd the congregation at Grace through many significant changes and was a key leader in the Christian community. Pastor Jerry passed the baton to Joel Lindsey, who served as Lead Pastor from 2011 until September of 2017. In the summer of 2018, the congregation voted to call Mike Matheson as Lead Pastor and we are now looking forward to the next decades of ministry in Racine County under Pastor Mike’s leadership. Over 150 years later, after the founding of the First German Baptist Church in Racine, it has evolved into the Grace Church you see today. The group of 17 German Baptist citizens is now more than 1,200 families of different cultures. The small church building has grown into a 75,000 square foot ministry facility on 62 beautiful acres of land, a very special gift from God! Thank you Lord, for this rich legacy you have provided for the people of Grace Church. We look forward to the adventure you have planned for Grace Church in the future!